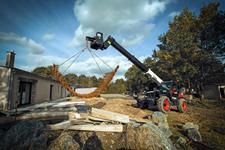 Bobcat Telehandlers: high performance at maximum reach and height! Bobcat has more than 50 years of experience in designing top-class compact equipment, so telehandlers fit perfectly in the company's core business. With high stability, perfect balance, versatility, compactness, reliability and productivity… Bobcat Telehandlers offer high performance in tough conditions in agriculture, construction, waste managment and many industrial applications. 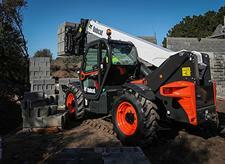 The T35.105 is a 10 m compact telescopic handler. The T35.105 model feature the latest in this field with the implementation of a wide range of features: true compact telescopic handler, top-level performance, operator friendly, new spacious and ergonomic cab, Hydrostatic transmission – power, precision and smooth engagement. 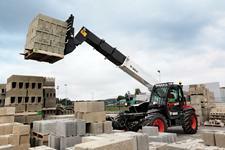 The T35.130SLP is a 13 m Telescopic Handler with 3.5 tons max lifting capacity. A robust design and high-end features make it particularly suitable for customers requiring full machine specifications and top-class performance. 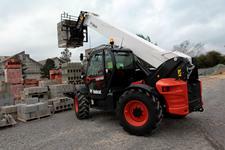 The Bobcat T35.140S is a 14 m lift-height telescopic handler with 3.5 tons max lift capacity using compact stabilizers. 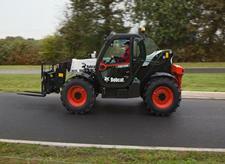 A simple and robust design – with intuitive and safe operation – makes it particularly suitable for multi-operator use. 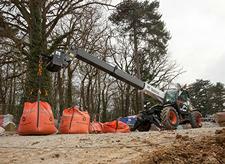 The T36.120SL is a 12 m compact telescopic handler incorporating both stabilisers and the frame-levelling system. The T36.120SL model features the latest in this field with the implementation of a wide range of features : true compact telescopic handler, top-level performance, operator friendly, new spacious and ergonomic cab, Hydrostatic transmission – power, precision and smooth engagement. With nearly 18 m lift height and a maximum capacity of 4 tons, the Bobcat T40.180SLP gives top-class performance for high-lift jobs. Its compact stabilizers, frame leveling and boom positioning system give you greater productivity for material lifting or people elevation.